"David said he saw something land in the field. He seemed so convinced." 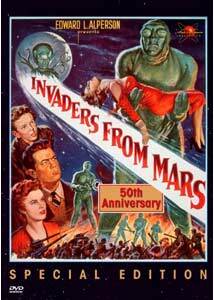 In hindsight, American fears in the 1950s about the spread of Communism and the tentacles of the "red menace" would seem to be at the root of the plot of William Cameron Menzies 1953 sci-fi classic Invaders From Mars, and on this Image release celebrating the film's 50th anniversary, it is hard not to see parallels and similarities to the prickly atmosphere of today's world. As recent tragic events have caused modern-day Americans to be more "vigilant" and "watchful," the inherent mistrust and suspicion at perceived threats (whether real or imagined) have almost become a sad daily reminder. To vaguely veil the threat in Invaders From Mars, the enemy does indeed come from space, but it has the ability to use some kind of freaky mind control on the populace to get it to do its evil bidding. It all begins when young astronomy buff David McLean (Jimmy Hunt) witnesses a flying saucer crash land behind a hill during a violent thunderstorm in the middle of the night. We are shown the saucer burying itself deep in the sand, leaving no signs of its arrival. When David's cheerful pop George (Leif Erickson) heads off to explore the crash site the next morning, just beyond a hilltop near a huge sand pit, he mysteriously disappears. He returns later in the day, but is noticeably different, now nasty, sullen and abusive . When David also notices a small wound at the base of his father's neck, it is apparent that something weirdly otherworldly is going on. Before long, a number of other townsfolk have vanished, only to return later as robotic, edgy automatons. It is up to David, who always looks like he just sucked on a lemon, and the kind, gorgeous Dr. Pat Blake (Helena Carter) to somehow get the word out and save the world. Time hasn't been especially kind to the special effects in Menzies' film, with the zipper-backed, goggle-eyed aliens looking every inch like the typical guy-in-a-suit variety. One historical, genre-related note is that one of the lumbering invaders was played by the towering Lock Martin, who was also Gort in The Day The Earth Stood Still. Their leader, the so-called Martian intelligence, is a silver-skinned disembodied head that floats in a big glass bubble, and who spends the bulk of the time doing wide-eyed looks left and right like Susanna Hoffs in a Bangles video. One of the most glaring flaws in this relatively short (79 minutes) film is the obvious padding that Menzies incorporates to stretch out the narrative and fill out the runtime. There are long, seemingly endless stock footage shots of tanks, jeeps and soldiers allegedly preparing for an attack on the alien stronghold, and when the director starts repeating some of them you know it was not just padding, but lazy, cost-cutting padding. Even during the sequences in the aliens underground lair, Menzies uses and reuses the same easily identifiable footage of the four lumbering Martians doing a slow jog through tunnels. One of the funnier what-the-hell examples occurs during a scene in the observatory, where we are treated to a painfully slow "rotate the telescope" shot that goes on for far too long. While Menzies' film has its share of eye-rolling visual idiosyncrasies (like using the same long halled for the police station AND the laboratory sets), the underlying story is pure pre-space program, imaginative sci-fi. Maybe to those not raised on the great sci-fi films of the 1950s, something like Invaders From Mars just doesn't have any merit as a genre "classic," and I guess to some degree I can understand that. There are no mind-boggling CGI aliens, no stunning transformation sequences, and of course no DTS audio transfer. At the risk of sounding positively ancient, all I can say is too bad for you; you don't know what you're missing. Image Transfer Review: This 50th anniversary version of Invaders From Mars was made from the original 35mm Cinecolor release print master which, according to the liner notes, is "preserved in cold climate-controlled vaults in Kansas along with such classics as The Wizard of Oz and Gone with the Wind". Even with that, be warned that the image quality of this release is not perfect, but for a fifty-year-old film it is not completely unexpected, either. Presented in 1.33:1 full-frame, the image transfer here has its share of age-induced flaws, including color flicker, debris, sprocket holes and a recurring vertical line that occurs from time to time. Colors, during daylight, do have that nostalgic, slightly muted 1950s look to them, while some of the night scenes are hard to decipher. The brief footage for the revised British climax (available on the alternate British version on this disc) doesn't fare as well as the rest of the print, and looks really washed out in comparison. Audio Transfer Review: There is some minor hiss and crackle on this Dolby Digital mono track, but other than that occasionally detectable annoyance, dialogue is reproduced clearly and cleanly. Mort Glickman's creepy alien choir score sound especially rich and deep. Considering the age of this one, nicely done. Extras Review: Image has included the full-length alternate British version of Invaders From Mars (01m:23:06s), which aside from running about four minutes longer, changes the ending completely (practically removing the entire montage sequence). I won't go into specifics, but the British conclusion seems wildly uneven and hastily edited, and is certainly far less foreboding. The British version's only other major difference is a slightly prolonged observatory sequence where Dr. Kelston rambles on a bit longer. Kudos to Image for the inclusion of both versions of the film; it is a nice touch, befitting this 50th anniversary release. A huge, but ultimately disappointing Photo Gallery of approximately 80 black & white promotional stills is marred by exceptionally poor quality of the images; most of the photos have a series of grainy ridges running through them. There is also an informative six-page booklet, titled Creation of a Classic, outlining an Invaders From Mars history, with a full page dedicated just to the print negative's history. It's a great read. Each print of Invaders From Mars (U.S. and British) is cut into 20 chapters. No subtitles are provided. This is a paranoid, Commie-fearing alien invasion 1950s sci-fi that is without a doubt both corny and ridiculously satisfying, and Image has graced Invaders From Mars with a fine special edition release commemorating its 50th anniversary. Two full-length, marginally different versions of the film are included on this disc (the U.S. and British releases), with Menzies' Cinecolor classic showing it can still stand along such other greats from that era as When Worlds Collide and The Day The Earth Stood Still. Recommended for old-school sci-fi buffs.